Axel Bruns lab at QUT is really starting to turn out some quality research – as evidenced by the summer vacation project (!) of Will Dawson. The types of users being retweeted also differ significantly from the most prolific tweeters in terms of plain numbers. 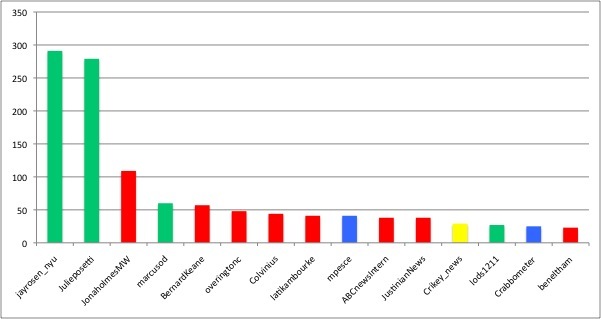 Of the top 15 retweeted users, eight are journalists, four are academics (including Posetti), two are regular citizens, and only one is the account of an official media outlet (@crikey_news, in yellow). Of the seven journalists, only one works for The Australian – Caroline Overington (@overingtonc). The lack of prolific tweeters (in terms of numbers) in this list supports one of the more long-standing theories of twitter – that just because someone is tweeting a lot, doesn’t mean people are actually listening to them.